You asked for it, we delivered it. A NHRA approved 1/4 mile drag strip welcomes every gear head with a thirst for power. All-day drag racing extends into the evening during this one day, winner take all event. If you are a lover of slammed rides, this is the event you don’t want to miss! 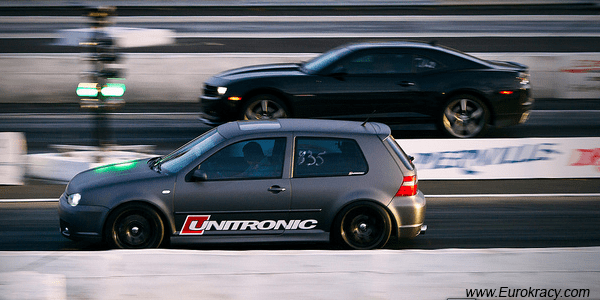 Aside from being a first in Canada, this unique low car competition pits the lowest of the low against each other and breaks the neck of each spectator as they see who competes next. Make sure to show up early to witness the coronation of the lowest ride at the Eurokracy Montreal. Soyez présent afin de témoigner celui ou celle qui sera couronné la voiture la plus basse d’Eurokracy Montréal. Take to the track and pit your ride against the very best of Eurokracy at the official Time Attack competition. Helmets are mandatory. Attacquer la piste et battre contres les meilleurs d’Eurokracy à la compétition officielle Time Attack. Les casques sont obligatoires. If you like the smell of burned tires and the noise of revving engines, this is the event you’re going to want to be a part of. Be present at the Burnout competition and experience a smoke show equal to no other. Si vous vivez d’odeur de pneus brûlés et de son excessif venant des moteurs révolutionnant à haut régime, voici un événement qui viendra vous rafraîchir les idées. Soyez présent pour assister au plus grand ” show de boucane ”. The cost is $30 per person over the age of 13. Can I still register my 2010 VW CC for show and shine even if i alread purchased a regular show ticket?